The Moto3™ World Championship kicked off the season with a classically close race, Antonelli emerging victorious from Binder and Bagnaia. 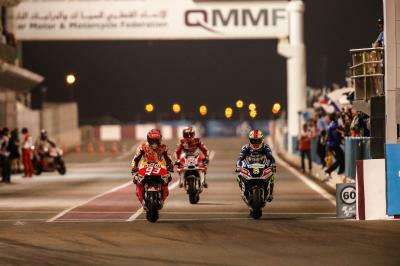 The 2016 Moto3™ World Championship officially began at the Commercial Bank Grand Prix of Qatar, a thrilling racing unfolding under the floodlights as 33 riders hunted a strong result to start their 2016 campaigns with. All riders opted for the medium front and medium rear tyre options. Starting from pole position, Romano Fenati (Sky Racing Team VR46) charged off the line to lead during the opening corners with Livio Loi (RW Racing GP BV) and Brad Binder (Red Bull KTM Ajo) hot on his tail. Loi attempted to take the lead with 17 laps to go before running wide at Turn 1, dropping outside the top five. 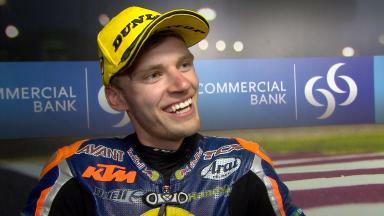 Brad Binder and Jorge Navarro (Estrella Galicia 0,0) tried to break away but the great impact of the slipstream in Qatar saw all of the top 20 riders running together. Positions constantly changed as the top five slowly began to ease out an advantage with 15 laps remaining. The straight continued to see dramatic changes in position, the rider leading out of the final corner frequently finding themselves sucked back to fifth. 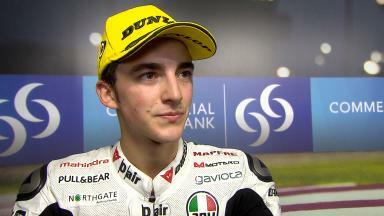 Throughout the race Francesco Bagnaia (Aspar Mahindra Team Moto3) was the strongest Mahindra, the Italian a stalwart of the top five. 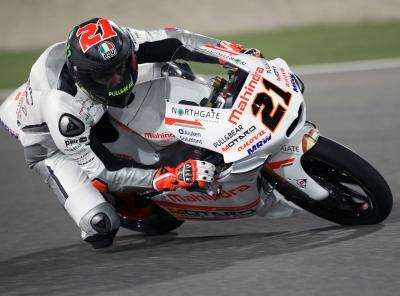 The Mahindra rider was able to dice with the likes of Niccolo Antonelli (Ongetta-Rivacold), repeating his superb ride from the 2015 race. 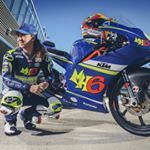 As the laps ticked down, rookie Nicolo Bulega (Sky Racing Team VR46) hunted the riders ahead, his aggressive style from the Moto3™ Junior World Championship going nowhere since stepping up. With 11 laps remaining the Italian cut the gap down to under three tenths, able to finally benefit from the leader’s slipstream. With half race distance complete, Binder once again took the lead, benefiting from the frantic fighting behind. 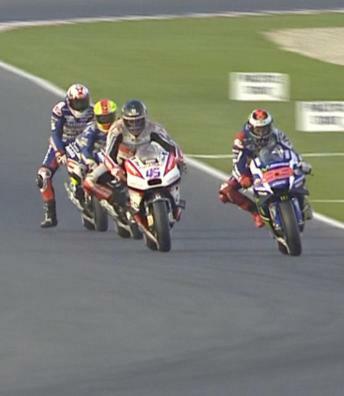 Try as he might, the South African was caught by Fenati on the straight and the brawl resumed once more. The leading six continued to tussle, Binder able to stretch a small lead through the corners but caught each time down the straight. Behind the leading six a large eight-rider battle rumbled along for tenth position, Fabio Quartararo (Leopard Racing) controlling the second group for much of the race. With four laps to go rookie Bulega struck and took the lead, Binder responding immediately as the two KTM men sparred for supremacy. 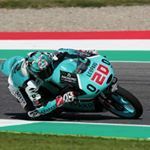 Bulega was able to retake the lead as his teammate Romano Fenati put in several hard moves to wrestle his way into second; meanwhile Enea ‘The Beast’ Bastianini (Gresini Racing Moto3) cut the gap with each lap. In true Moto3™ style it all came down to the last lap, Binder beginning it in the lead as Romano Fenati ran wide at the first corner and dropped to sixth. The corners ticked down as Antonelli tucked in behind the South African, waiting for his chance to strike. The drag to the line was where it all happened as Antonelli played the race to perfection, pulling out of Binder’s slipstream to steal the race by 0.007s. 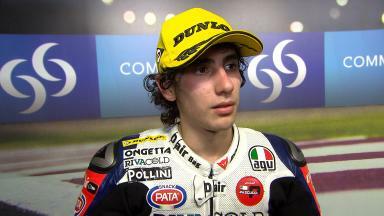 Binder was second with Bagnaia putting his Mahindra on the podium. This is Antonelli’s third career victory and his best ever start to a season. In similar fashion, Binder’s seventh career podium is by far the South Africans best opening round. Fenati secured a solid fourth from pole while Bastianini rounded out the top five. Bulega’s heroic charge saw him end sixth on his full time World Championship debut ahead of Jorge Navarro, Livio Loi, Philipp Oettl (Schedl GP Racing) and Jakub Kornfeil (Drive M7 SIC Racing Team) completing the top ten. 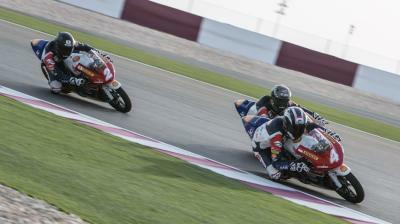 Juanfran Guevara (RBA Racing Team) fell on the penultimate lap but was able to remount. The fastest lap of the race was a 2’06.171 from Livio Loi on lap 8. Antonelli leaves the opening race leading the championship with 25 points. The Moto3™ World Championship are back on track on the first of April for Free Practice 1 of the Gran Premio Motul de la República Argentina. Full results from the race can be viewed here. Bonita carrera ayer! Luchar con los mejores después de todo... ! Gracias por vuestros mensajes!!! Great battle yesterday, fighting with the best ones after all... ! Thank you for all your support!!! 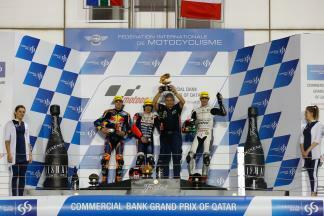 A spirited performance saw Francesco Bagnaia take to the podium for the second time in his career with third in Qatar. 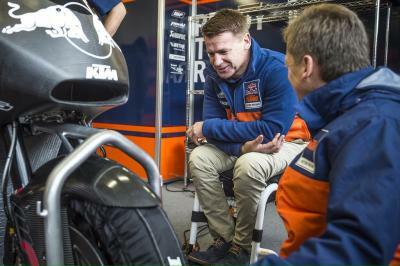 Britain's Bradley Smith will join the factory KTM effort in the MotoGP™ World Championship for the 2017 and 2018 seasons. 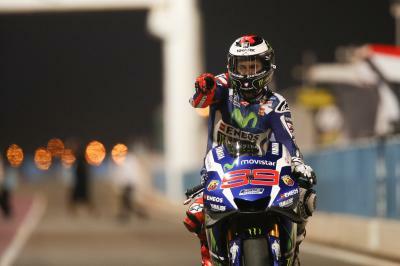 The 2016 MotoGP™ World Championship got off to a fiery start in Qatar as Lorenzo blitzed the field ahead of Dovizioso and Marquez. Big news! @BradleySmith38 signed as @MotoGP factory rider for 2017-2018! The procedure for restarting a race after a red flag has been revised to allow the bikes to return to racing sooner. MotoGP™ riders headed out as the sun began to set over Qatar, Marquez heading the 20 minute session ahead of Viñales and Lorenzo. Here's a quick recap of where the riders stand after qualifying for the MotoGP race at the #QatarGP. Race day for the Moto2™ World Championship began with Zarco topping Warm Up ahead of rivals Folger and Morbidelli.